If there is a problem with implementation then monitoring is the solution. This is a preliminary conclusion in the report of the European University Institute in Florence, which is tasked by the European Parliament to prepare a report on media freedom in the Western Balkan countries. This is the same institute which the member states encouraged the European Commission to continue to support in their studies in this area. The preliminary findings in the report were presented by Professor Pier Luigi Parcu before the human rights subcommittee of the foreign affairs committee in the European Parliament at a special meeting attended also by some of the rapporteurs for the countries in the Western Balkans. The authors of the report have found out that in the enlargement countries in the region legislation is good but implementation is very weak. Currently, the institute is developing for the European Commission an experimental application for media monitoring which could be a tool for monitoring of media freedom in the region. The institute also recommends the establishment of a regional network of regulators because there is a serious problem with their independence, professionalism, capacity and political independence. The regulators need to be systemically confronted with the basic media standards and in the framework of the regional network to seek good solutions and exchange practises. One of the big problems which the analysts have found out is the lack of transparency of media ownership and also the funding of media outlets. Journalism in these countries is very weak and that it is why it is proposed the EU to focus more on supporting investigative journalism because it is key. The institute's report is divided into four parts as one of them deals with the actions being undertaken at European level to solve the problems with freedom of expression and media in a more general perspective. It is reported that in the past years EU has focused more on these issues, especially in two chapters - Chapter 2, which deals precisely with audiovisual services, and Chapter 23 which covers fundamental freedoms and justice. The Florence-based institute proposes, however, the problems with media to be exported into a separate negotiating chapter "Media Freedom". In this regard, Andris Kesteris, adviser for civil society and media in the General Directorate for enlargement in the Commission, recalled the frequent complaints about permanently increasing new criteria for the enlargement countries, pointing out, however, that they are groundless. According to the political criteria from Copenhagen, the European Commission has a mandate and even an obligation to identify all deficiencies in the area of human rights. It can even demand the candidate countries to find a solution to the identified problems. He also recalled that this year the Commission has decided to "go back" to the EU's fundamentals - rule of law, democracy and economy. In the Western Balkan region, the law ensures the fundamental rights, but this remains mainly on paper, he said. According to Mr Kesteris, the freedom of expression has a unique place among the other fundamental rights because it ensures their implementation. Media freedom can change attitudes and ensure a positive political pressure, especially by public media. But for media freedom to be ensured an efficient judiciary is needed with "adequate understanding of individual freedoms", the Latvian expert in the Commission added. About the huge significance of media freedom spoke also MEP Eduard Kukan (EPP, Slovakia) who heads the delegation of the European Parliament for relations with Albania, Bosnia and Herzegovina, Serbia, Montenegro and Kosovo. He recalled that the transition in the former authoritarian states in the EU has not always been successful. In the Baltic states it was the fastest, he said, but in other nations the authoritarian legacy is still present in the media landscape. The situation in the Western Balkans is a little bit more complex because, on the one hand, they have to deal with the transition from the old regime and, on the other hand, with the legacy from the war that accompanied the break-up of former Yugoslavia, explained Mr Kukan. He recalled that media had an essential role during the military conflict in disseminating hate speech and inspiring inter-ethnic intolerance. Freedom of media is a topic that deserves our attention and should not be omitted from the accession negotiations, he called. For support by the European Parliament and EU at large called Croatian MEP Nikola Vuljanic (Confederal Group of the European United Left - Nordic Green Left). As of this year he is a rapporteur on Albania. Starting from the position of his experience in the region he divided media into three types: state-owned (because they definitely are not public), private and the smallest group is of the independent media. A very strong pressure is needed on the enlargement countries and serious support for the smallest group of media because they are a guarantee for future free media in the region. The biggest danger at the moment is of media "yellowing" as he put it, meaning to become tabloids. Media are trying to survive by turning their backs to basic criteria and their genuine role for progress. According to the rapporteur on Serbia, however, self-censorship is the biggest challenge in the region. Jelko Kacin (ALDE, Slovenia) recalled that Serbia is the biggest country in the region and without a breakthrough there we cannot expect the rest to follow suit and be bolder in solving these "huge political challenges for the normalisation and accession", he said. Media ownership in most countries in the region is not transparent. Until we know who stands behind and manipulates the public there will be no transparency and that is the main problem. Politicians are those who stand behind, believe me, Mr Kacin appealed. Another problem he outlined is the size of the market, especially in the small countries. This means that practically there is no market there and that is why media cannot survive on economic grounds. You cannot expect media to be professional in Montenegro where there is always strong competition by media from Serbia, Croatia, Bosnia and Herzegovina using almost the same language. Without financial support we delude ourselves that something can change, he added and concluded: "Without media freedom there is no democracy and there is no accession". But do we want more cases like Turkey - to negotiate for decades? The meeting in the subcommittee for human rights was attended by the ambassadors of some of the affected countries. Statements made the ambassadors in Brussels of Kosovo, Serbia, Albania. A representative of the embassy of Montenegro also spoke as well as from the Macedonian embassy. All of them made a brief review of what their governments were doing to solve these problems. 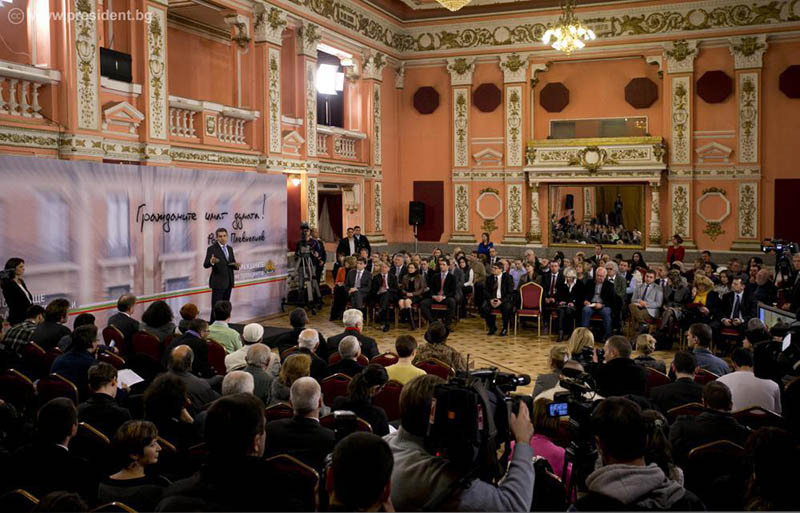 Almost an hour after the discussion about the media situation in the Western Balkans ended in Brussels, in Sofia the third citizens' debate took place, organised by Bulgaria's President Rossen Plevneliev. The discussion was precisely about media. The head of state promised organising such dialogues with citizens during the visit of European Commission Vice President Viviane Reding, who is responsible for justice and fundamental rights. The discussion on November 27, though, seemed vague, directionless and too meaningless. It was a complete reflection of the cold civil war that has been going on in Bulgaria. 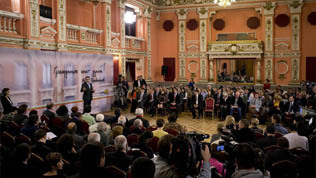 The president's debate was not attended by key representatives of the media business, although among the audience there were representatives of media that are considered dependent. The main participants were well known faces who focused predominantly on the diagnose rather than solutions. And some of the speakers had the single aim to discredit the president. The discussion was moderated by a popular presenter from the national TV who, however, had difficulties to filter provocation from genuine issues. Such was the case, for instance, with one of the participants, Georgi Zhechev, who asked when will finally begin a genuine decommunisation of media. Why are all media in communists' hands? There is blood on their hands, he said. The question is key as became evident in all discussions at international level about the media situation, some of which took place in Sofia, like the panel about the fourth estate as part of this year's Sofia Platform, which this website moderated. In his introductory remarks the president said that "freedom of media is not an achievement of our democratic society when its price is paid by those who are defamed publicly. Journalism's independence is not a value when its speech is used to discredit reputations, to blacken or shoot out inconvenient opponents and through suggestions and violating the main task of media - to inform in an unbiased way, to point to the truth". But he only proposed respect for the ethical code and transparency of media ownership. The ethical code, however, is not signed by a crucial part of media in Bulgaria, while media ownership, as media journalist Vessislava Antonova with the Capital daily explained, is required by the law on obligatory deposition of print and other productions. This law was adopted on demand by the media community, she recalled. However, it is not implemented. Just like in the EU's accession process, mentioned above. - To create a public register of owners of media, communication agencies, multiplexes, distribution firms, peoplemetric companies, media shops, where not only ownership down to a physical person is announced, but also the sources of funding, annual reports, etc. During the discussion two key issues were brought up - is the public ready for a reform and how will the proposals be passed. According to Ivan Radev, a representative of the Association of European Journalists, things should be addressed in a bit more minimalistic way because if we need a media law we have to have a parliament with sufficient trust in it to adopt it. There should also be national consensus. However, at this stage, there are no signs of both. Another very important issue that was brought up was about funding of partisan TV outlets. 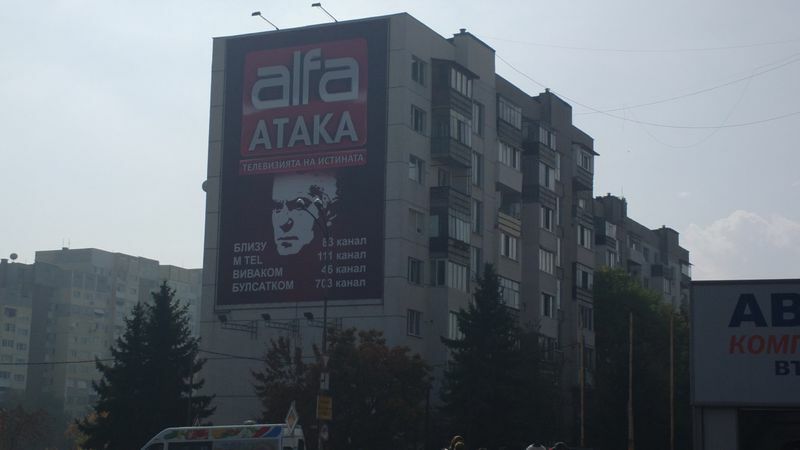 The latest TV on the overcrowded Bulgarian media market is Alfa, owned by the xenophobic party Ataka, on which the government is hanging. There are billboards advertising the new TV all over Sofia. We are still awaiting the official opinion of the Council for Electronic Media whether it is legal a political party to own a TV outlet. The issue is treated in the law on radio and television, where it is stipulated that political parties cannot sponsor programmes and that independence is ensured of suppliers of media services and of their activities from political and economic interference. euinside is strongly engaged with the issues because we, too, believe that free media hold the key to the development of society. In September, I participated virtually in a discussion organised by blEUprint, a non-governmental organisation, on the topic "Media in Bulgaria - a guarantor of democratic processes or a tool for influence?". Then I said that the remedy should begin from the public media so that they genuinely turn into public ones as a function not in terms of a type of funding. For the purpose it is necessary their budget to be made public on their websites, together with reports on spending. The information how many journalists we "sustain", what responsibility the general directors take for content and sometimes abuse with public air should also be made available to the taxpayers. I also proposed the establishment of a possible mechanism for transparency and accountability which should not spare private media as well. You can watch my entire contribution in the attached video file.